Researchers from the Service Prototyping Lab have found new methods to tame and control cloud infrastructure and platform services which, despite the best intentions by the providers, are often volatile, unavailable or unreliable. With the new methods, applications remain mostly unaffected from the problems. Two publications about the methods will be presented at the upcoming 8th IEEE/ACM UCC conference and the co-located CloudAM workshop. The first paper, to be presented in full in the main conference with a competitive 27% acceptance rate, introduces the design and implementation of StealthDB, a novel kind of cloud-native database system which combines in-memory areas, files and cloud compute services. In StealthDB, embeddable into software applications, users can configure their preferences on availability, performance, confidentiality and capacity efficiency, and the system takes care of the rest, including data coding, distribution and operator scheduling. This allows for novel, user-centric cloud applications. With the underlying techniques originally conceived at Technische Universität Dresden’s Cloud Storage Lab and now refined at the SPLab in Switzerland, the barriers to adoption of service and cloud technologies will be reduced and the acceptance with companies will increase considerably. Josef Spillner, Martin Beck, Alexander Schill, Thomas Michael Bohnert: Stealth Databases: Ensuring Secure Queries in Untrusted Cloud Environments. 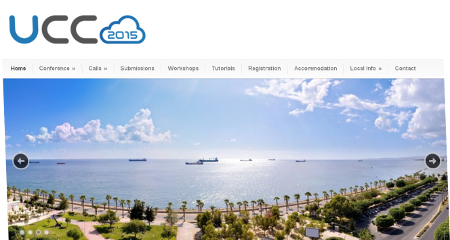 8th IEEE/ACM UCC 2015, 10 pages. The second paper, to be presented at the co-located 4th CloudAM workshop, a long-running and traditional workshop series dedicated to applications in the cloud, evaluates the Cloud Native Applications design with a business application scenario. The researchers have converted the Zurmo CRM web application into a cloud-native application and confirmed the inherent resilience and scalability properties of the design. Sandro Brunner, Martin Blöchlinger, Giovanni Toffetti, Josef Spillner, Thomas Michael Bohnert: Experimental Evaluation of the Cloud-Native Application Design. 4th CloudAM 2015, 6 pages. These international publications confirm the competencies of the group in leading-edge service and cloud research. We are looking forward to apply the knowledge and refine the application design methodologies in additional business applications. This entry was posted in *. * by Josef Spillner. Bookmark the permalink.